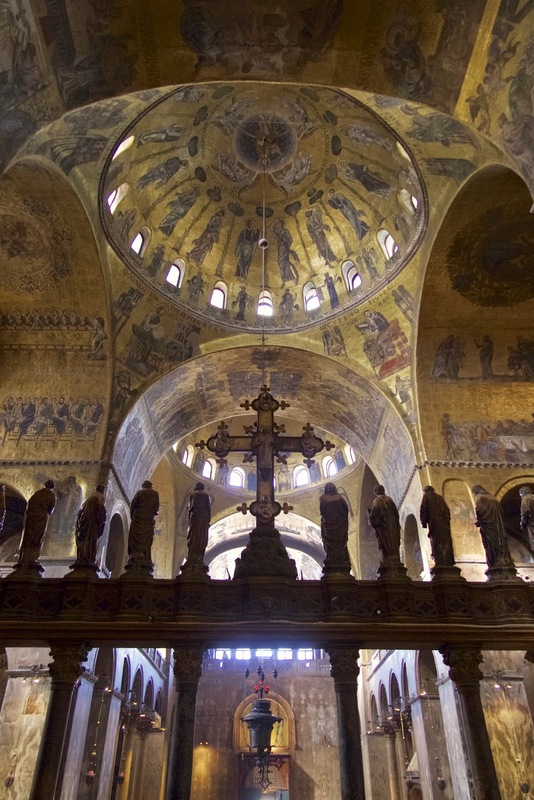 Arriving in the San Polo district of Venice, I stand in front of one of the city’s largest churches: Santa Maria Gloriosi, better known as the Frari, named for the Franciscans who constructed it. It is a large brick-built Gothic edifice, and like other tall churches built on Venice’s uncertain foundations, is trussed with enormous wooden beams which span the archways within. Entering into the nave by the west door, I am immediately struck by the vast and imposing marble tombs in the side walls, monuments to great artists such as Titian and Canova. I make directly for a small side chapel in the far left corner. There, under a simple marble slab in the chapel floor, lie the mortal remains of one of Venice’s greatest composers. 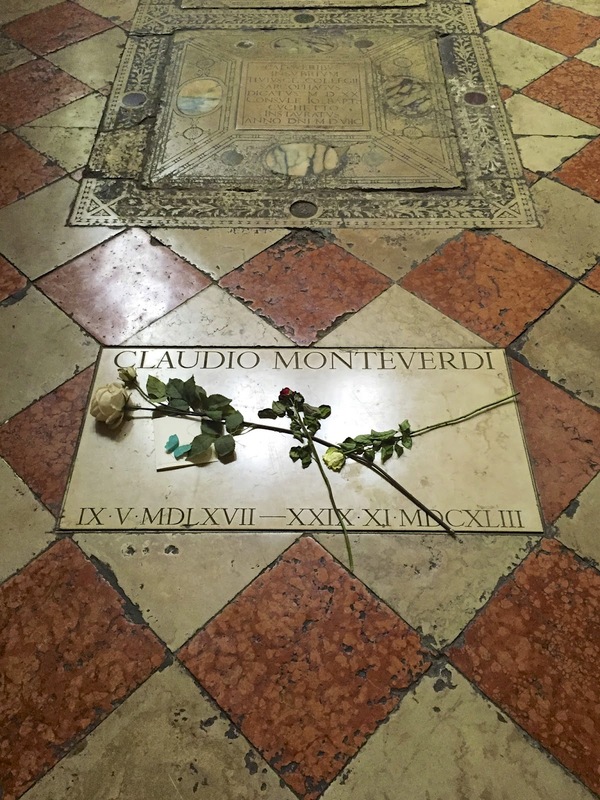 The tomb is marked with his name and dates alone: Claudio Monteverdi 9 May 1567- 29 November 1643. On a stand to the side rests a facsimile copy of his most famous work, the 1610 publication of his Mass and Vespers. 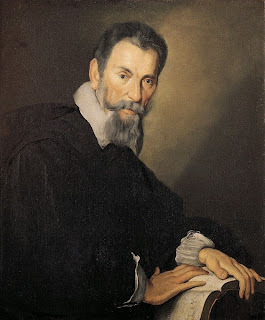 It is the Vespers which has become most synonymous with Monteverdi’s name, and no wonder, for it contains ninety minutes of the most exciting and brilliant music one could ever hope to hear. 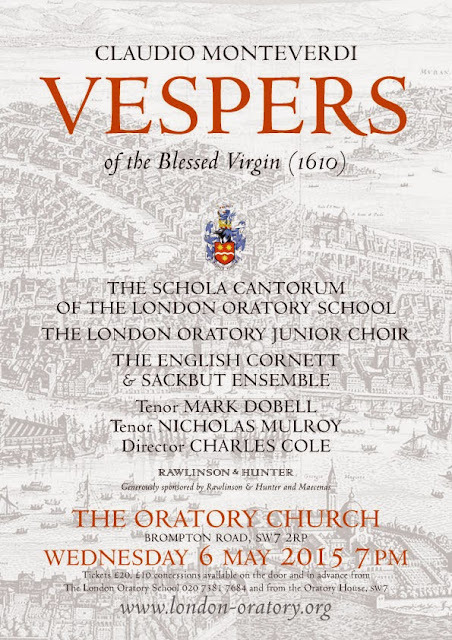 My visit to Venice precedes a performance of the Vespers at the London Oratory which I am shortly to conduct involving two choirs: the Schola Cantorum of The London Oratory School and The London Oratory Junior Choir. Buying a large print of Monteverdi at the gift shop to put on the wall of the Song Room at school, though not quite sure how on earth I will get it home, I set off for St Mark’s. The streets and canals of Venice seem to embody so many of the characteristics found in Monteverdi’s music: variety, splendour, and above all, colour. Walking to the Grand Canal, I take a vaporetto, one of Venice’s large water buses, down to San Marco. Entering the great Byzantine Basilica, amid throngs of tourists, I find myself in the vast cavernous nave. The effect of the marble floor and walls, and the golden mosaics overhead in the rounded recesses of the domes, is totally overwhelming, despite having seen it many times before. Finding a quiet spot in the gallery, I put on my earphones to listen to a famous recording of the Vespers. The crowds of people melt away and I am left seemingly alone in the basilica, listening as the performance, which was recorded here, comes back to life. It is absolutely extraordinary to hear the acoustics on the recording exactly matching the building around me. There are many reasons why this work is usually the preserve of concert choirs, not least because of the complexity and expense involved in performing it. There is a myriad of professional adult choirs which sing in the major concert halls and tour around the world, none greater with reference to this particular work than the Monteverdi Choir itself, founded and conducted by Sir John Eliot Gardiner, whose 1990 recording I am listening to. 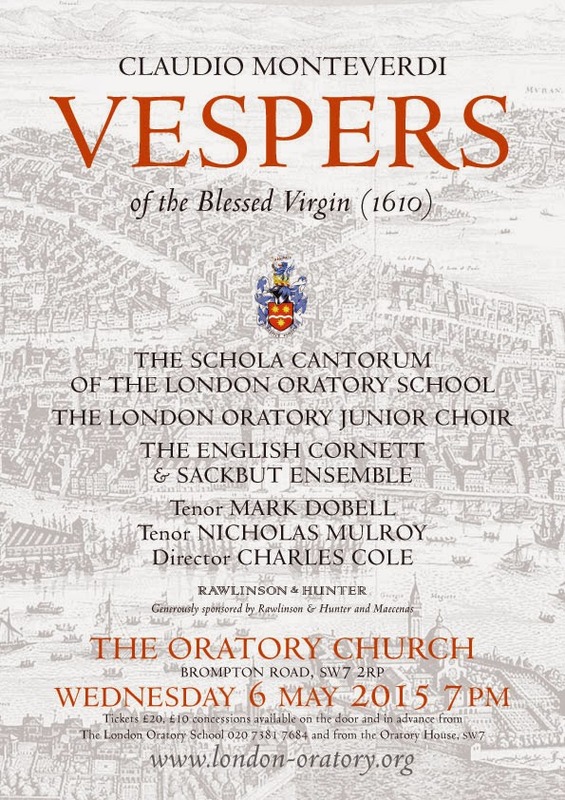 However the performance at the London Oratory will be sung by two liturgical choirs, and more significantly still, it will be sung by childrens’ voices. Readers of New Liturgical Movement will be very familiar with photographs of the beautiful Liturgy which is maintained at the Oratory. However, there is another less visible but nevertheless incredibly important dimension to the work of the Fathers of the Oratory. This is their school, The London Oratory School, founded in 1863, where 1400 young Catholic pupils are educated according to the unique traditions and standards of the Oratory, in the spirit of St Philip Neri. We are truly blessed that these boys receive such an education in their Faith and experience the Liturgy of the Oratory, most especially those in the Schola who sing Mass at the Church every Saturday. In addition the London Oratory Junior Choir for boys and girls at Catholic schools across the capital, sings the 10am Mass at the Oratory on Sundays. Training boys and girls to sing such music is certainly a challenge, but the truth is that the ceaseless toil and hard work involved with daily rehearsals make the results all the more rewarding. Focused children can achieve pretty much anything, and the higher you set the bar, the more they amaze. In the past year the Schola boys have sung J.S. Bach’s St John Passion, Victoria’s Requiem and most recently a joint performance of the B minor Mass, Bach’s ultimate choral challenge, with Westminster Cathedral Choir. Introducing young Catholic children to this great repertoire is not simply a matter of duty, it’s an incredible privilege too. The Monteverdi Vespers is a conundrum on many levels. To start with, it is probably better to approach it as being a portfolio of music, some of which is appropriate for use at Vespers, some of which is less so. From a performance perspective, there are many different decisions to be made concerning the order of movements, the allocation of parts, transpositions and keys, to the extent that no two performances are ever likely to be the same. Much has been written about the work, and in particular there is great debate amongst scholars concerning the placement of the Motets, or Sacris concentibus, as to whether they are intended to replace the repeated Antiphons, or follow them, or whether they are in fact simply free-standing Motets for performance outside the context of Vespers. At our own concert performance on May 6, we will sing the complete work in the order of the original 1610 print, with the seven-part Magnificat. The boys of the Schola, as well as the Junior Choir, will be joined by two outstanding tenor soloists of great distinction, Mark Dobell and Nicholas Mulroy, and accompanied by The English Cornett & Sackbut Ensemble. It is always a thrill to work with period instruments, and amongst them will be an Italian seventeenth century triple harp and a theorbo, a long-necked member of the lute family which one is more likely to encounter in renaissance paintings. However music is an art which comes to life, and we can only imagine how close, or not, we come to what Monteverdi heard with his own ears.